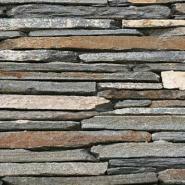 A thin, light weight stone installed to vertical surfaces. Thin Veneer is a great option when you have weight limitations. It weighs 15 to 17 pounds per square foot. Thin Veneer does not require footing for support. Its slenderness also makes it easier and faster to support, trim, and cut.